Computer Science A emphasizes object-oriented programming methodology with an emphasis on problem solving and algorithm development and is meant to be the equivalent of a first-semester course in computer science. It also includes the study of data structures and abstraction. The overall goal for designing a piece of software (a computer program) is to correctly solve the given problem. At the same time, this goal should encompass specifying and designing a program that is understandable, and can be adapted to changing circumstances. The design process needs to be based on a thorough understanding of the problem to be solved. Part of the problem-solving process is the statement of solutions in a precise form that invites review and analysis. The implementation of solutions in the Java programming language reinforces concepts, allows potential solutions to be tested, and encourages discussion of solutions and alternatives. The analysis of programs includes examining and testing programs to determine whether they correctly meet their specifications. It also includes the analysis of programs or algorithms in order to understand their time and space requirements when applied to different data sets. Data structures are used to represent information within a program. Abstraction is an important theme in the development and application of data structures. Standard algorithms serve as examples of good solutions to standard problems. Many are intertwined with standard data structures. These algorithms provide examples for analysis of program efficiency. For more detail on the course topics covered in Computer Science A, see the Course Description. Interested in Taking AP Computer Science A? 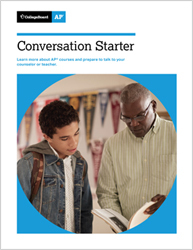 Does our school offer AP Computer Science A?